You should see the double bill that LA Opera just opened on Saturday night at the Dorothy Chandler Pavilion. It’s not just that it is one of the best productions the company has mounted in the last four years. It’s also evidence that the company has without question transitioned into a new artistic era. The evening pairs two short works that couldn’t be much further apart historically in the opera repertory. The heroines of Purcell’s Dido and Aeneas and Bartok’s 20th-century masterpiece Duke Bluebeard’s Castle may be centuries apart musically but love doesn’t fare much better for either of them in stories where life is the cost of love whether hearts are broken or not. What makes this production more than the sum of its parts, though, is the direction of Australian Barry Kosky. Kosky’s clever, edgy vision—that has been very successful throughout Europe in his role as intendant at Komische Oper Berlin—has been seen here before in the company’s wildly popular staging of Mozart’s The Magic Flute last Fall. He has again created a sharp, attractive, and thoughtful staging that presses buttons and is impossible to ignore. But more than that, this second big success for Kosky here in Los Angeles makes him something of a house provocateur. It was a role that Achim Freyer played for the company throughout the 2000s during the tenure of former company Artistic Director and Chief Operating Officer Edgar Baitzel. Freyer produced some of the most beautiful and thought provoking stagings over that decade—productions that are still discussed years later with great passion among the opera-going faithful. But a lot has changed in the last five years since Baitzel’s untimely death in the national art scene, and LA Opera has been in transition on many fronts. Economic realities have made the company leaner and meaner but things under current President and CEO Christopher Koelsch are clearly no less ambitious and inventive than they were a decade ago under Baitzel. In some ways, Kosky might be considered Koelsch’s Freyer, bringing the edgiest of opera visions to LA Opera. Of course, that’s an unfair comparison, but Kosky’s work and relationship with the company does signal the fact that LA Opera continues to be a spirited, inventive and risk-taking organization. It’s survived recent "fires" and is roaring full steam ahead. 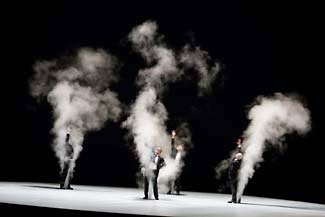 That steam is quite literal in Kosky’s double bill. Duke Bluebeard’s Castle makes good use of it as Judith opens the fifth door to reveal her new husband’s great estate. As the orchestra swells into Bartok’s giant C major chord, Bluebeard, sung here by Robert Hayward, and his three doppelgangers are engulfed in huge jets of steam onstage. There are no physical doors here for Judith to open or keys to wrangle. However, these mirror-Bluebeards in their contemporary dress suits spout gold dust, water and flowers from their hands to represent the treasures and horrors Judith finds. All of this takes place on a slanted circular starkly white turntable that leaves both vocalists completely exposed for the entire course of the piece. It’s a very physical performance—one that focuses on the emotional relationship between the two lovers. Claudia Mahnke’s Judith is no wilting flower. Kosky has envisioned her as a more forceful, self-possessed woman who will immerse herself totally in Bluebeard’s world no matter the cost and often despite her husband’s palpable physical discomfort as he contorts and falls in response to her repeated treaties. This is a Bluebeard that is sure to leave a bruise. Love claims other victims in this staging. Dido doesn’t fare much better and, as he does with Judith, Kosky takes a very different approach to this Queen of Carthage. Here Dido is more rash and impulsive giving up on Aeneas and declaring his betrayal before he’s even had a chance to act on his divine orders. She is less the victim of Aeneas or fate, but actively hurtling to her doom nonetheless. Kosky places the action at the foot of the stage, the entire cast seated at times along the length of a huge bench. The chorus in their hodgepodge of period costumes (or in two specific instances just G-strings and hats) occasionally abandon the stage for the pit joining the smaller Baroque size orchestra. Kosky mines the work for some quirky laughs, particularly through the unusual sexually inappropriate boundaries of the three witches who anticipate the lovers’ downfall. The three countertenors in these roles—G. Thomas Allen, Darryl Taylor, and Brenton Ryan—almost run away with the evening with their drag shenanigans. But that isn’t about to happen under Kosky’s eye. Dido and Aeneas is given a slowly burning intro and denouement to parallel the orchestra writing of Bartok’s opera, creating another parallel between the two short works on the bill. In the end, Dido is left alone onstage gasping for air for nearly 10 minutes as choristers and orchestra exit one by one leaving her truly alone to finally expire in silence. It’s a haunting image; just one of many that populate the evening. Musically there is much to recommend the evening. Many of the soloists are first rate including Mahnke and Paula Murrihy whose Dido sears when needs to. Kateryna Kasper is a spirited, forceful Belinda as well. Steven Sloane conducts the orchestra, who were surely suffering whiplash from the hundreds of years of musical history separating these works. The period techniques and instruments that were used to augment Dido and Aeneas were a tough fit overall and it wasn’t until the Bartok that the players got their full chance to shine. Overall, though, this evening of lovers lost was a reason to rejoice. It was a great performance from a company that has a lot on its mind and is heading in the right direction. They’ve weathered the storms of recent years beautifully, unbowed and looking to the future. Now is the time to see where they are heading. Dido and Aeneas and Duke Bluebeard’s Castle are onstage for five more performances through November 15. 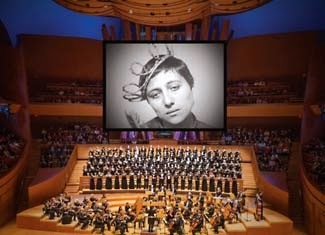 The Los Angeles Master Chorale kicked off its 51st season under Artistic Director Grant Gershon last Sunday night and wasted no time setting the tone for the next 50 years with an ambitious piece of newer music on the program that involved a multi-media presentation alongside the ensembles’ world-class musicianship. A sub theme this season are passion stories. Two LAMC favorites – Bach’s St Matthew Passion and Tan Dun’s Water Passion will feature prominently later on next year. But in another twist on the topic, the Chorale performed Richard Einhorn’s Voices of Light to start fall on Sunday. This very popular work has become Einhorn’s calling card since its premiere and has been heard all over the world in a variety of formats. While Einhorn has produced a wide variety of compositions over his career, he is particularly known for his music for films, and Voices of Light honors that relationship beautifully. The piece draws direct inspiration from Carl Dreyer’s film, The Passion of Joan of Arc. And while the choral work can serve as a sort-of soundtrack, it just as easily stands alone as either an oratorio or operatic endeavor. On Sunday, Gershon and his choristers stuck closely to the soundtrack interpretation with Voices being performed in conjunction with a screening of Dreyer’s masterpiece. However, this isn’t to say that presenting the choral work alongside the film is necessarily a perfect fit. Despite a wonderful, rich, and textured interpretation of the score last Sunday, the simultaneous screening of the film with the choral performance created issues. First, there are elements and passages from the libretto that do not coincide with the ongoing action in Dreyer’s film. The text, an assemblage of Latin and French sources including some of Joan’s own writing, is arranged artfully if not in a directly narrative way. With the film running, the musical score often lost out with the visual images dominating the audience's consciousness in the moment. This was especially true of the admirable performances turned in by all of the Master Chorale's soloists. Though their splendid voices could be heard, focusing on them in the wake of the giant face of Dreyer's star, Falconetti, was frustratingly difficult. At the same time, Einhorn’s musical experience with film was clearly on display throughout. The score is both modern and minimal and it effectively underscores the emotional elements of the film. The score references several significant periods in the history of chorale music, shifting gears with ease. But this season opener despite its beauty and simplicity too often got left on the side lines. Nevertheless, it certainly left the audience looking forward to more in this new season with promises of great work around every corner.